The Reel Rhino: Reel Rhino Review: Monsters ...AND MORE! So, I have been a busy little been...which has been good for Ryan (that's me), but bad for the Reel Rhino (also me). I am sorry for the two week hiatus, but my real work has been interfering with my "reel work." There are a lot of great movie events on the visible horizon...Harry Potter fires up for part 1 of the Deathly Hallows, sans 3-D, but playing in IMAX. Due Date will show us if Todd Phillips can successfully live up to the uber-buzz he built around his name in the year and a half since The Hangover. Check below and you'll find the Due Date trailer, if you haven't yet seen it yet. The Hangover 2 is due out summer 2011...without Mel Gibson (Thank God! )....I will take Liam Neeson over Mel Gibson any day. Mel seems to hate all races, creeds, religions, and women...basically, Mel hates anyone who isn't Mel Gibson. Who needs him. 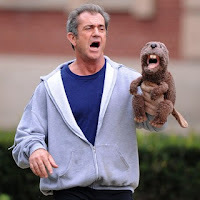 I do feel sorry for Jodie Foster's Beaver....HEY...EASY!...I meant Jodie Foster's film, THE BEAVER, which she directed and was originally slated for a 2010 release. Yikes...you could maybe give the movie away, but Mel Gibson is currently filmic kryptonite! 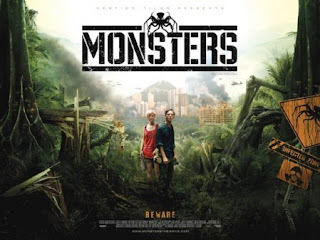 I have seen a few movies over the past few weeks, and before I get into my MONSTERS review, I wanted to share some of this with you. 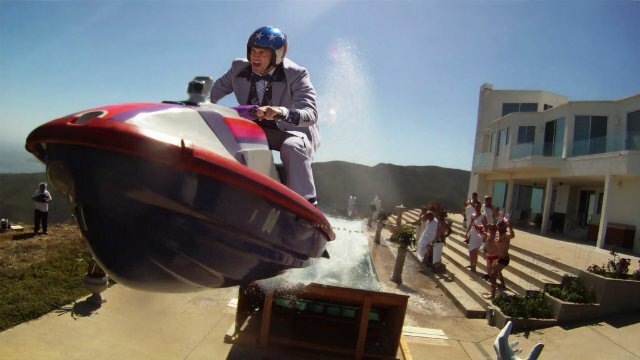 JACKASS 3-D: This was everything I expected it to be. I enjoyed it and while I went to see it by myself, I was happy to be in a semi-full theater, so I could laugh with the crowd. Some of the skits were funny, but some were pretty played out. At this point, I would like to see a Jackass Greatest Hits. Yes, Johnny Knoxville's old man costume is hilarious, but there was something about the incestuous make-out session with his "grand-daughter" that I thought was just not that funny. The 3-D was GREAT and their kind of hijinks are built for the 3-D presentation, but in general, they seem to be running out of content and truly shocking material. Sadly, I think they will keep amping it up until someone is seriously hurt or killed during filming. I may seem down on it, but in general, I had a great time and give it 4 of 5 reel rhino horns. 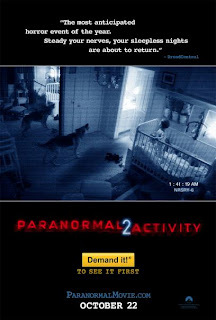 PARANORMAL ACTIVITY 2: In short, I liked it. 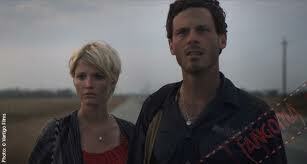 I liked the first a great deal because of what it was...a guy and a camera who wanted to make a movie. He did and look what it became. I loved the first movie's sense of independent filmmaking, much the same way I enjoyed PRIMER. The original Paranormal Activity was taken under the wing of Steven Spielberg, and that is never a bad thing. I think that PA 2 has a set-up that is is quite a stretch, but it ends up being a creative way to get us the cameras in every room to catch the action. I also very much liked the PREQUEL aspects of this movie. I do sense that PA3 is going to be made next year and I hope they keep it to a trilogy and tie up the loose ends of this story. In fact, I would very much like a traditional horror film for the third (and hopefully FINAL entry into the series). All in all, these things are crazy profitable with 2 costing 2.75 million and making 40 mil in the first week...but PA1 cost $11,000 and has thus far grossed $107 MILLION EFFING DOLLARS! 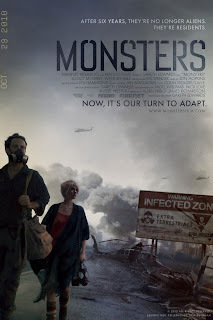 This is much in line with this week's review MONSTERS....also a crazy economical flick in terms of budget. Paranormal Activity 2 receives 3.5 of 5 horns. I was very happy to see Sprague Grayden on the big screen. I very much enjoyed her run on the short lived, but great Fox show, JOHN DOE, and I think she did a great job! BACK TO THE FUTURE 25th Anniversary Re-Release - I saw this first when I was 10 years old. When I was 14, when BTTF II came out, all I could think about it hoverboards! By far, this film and this series deserve a blog entry of their own, which I hope to do soon. All in all, I loved BACK TO THE FUTURE then and I love it now. The only thing I thought was exposed quite a bit in the upped quality version was a bit of the make-up in the scenes with 'aged' characters became more apparent, but hell, you have to give them credit for these shots being completely practical effects. I will not hold it against them at all, because this movie is hilarious and a superbly told tale. 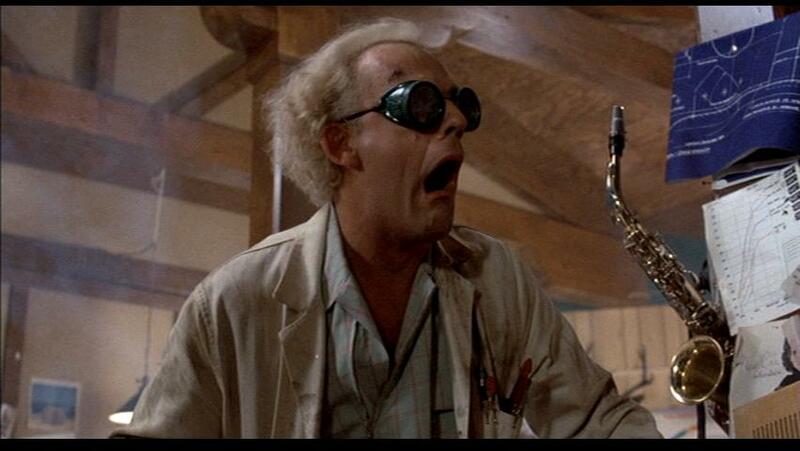 I will tell you I have not sat and watched BTTF so intently since I first saw it in '85. Really paying attention now, as a serious movie-goer, I saw so much more depth than I ever have. Doc Brown, played by Christopher Lloyd, is fantastic...I reallly feel it is near an Oscar worthy performance. If you don't believe me, watch it again....he is brilliant! 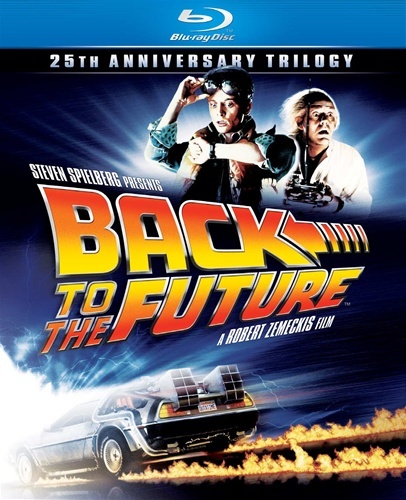 The Bob's (Zemeckis and Gale) and Steven Spielberg really created something special and this is a film that has survived well, the 25 years since its original release. 5 of 5 horns, all day, from THE REEL RHINO! This flick was slated for theatrical release on Oct. 28th, and I actually got to see it early on Time Warner On-Demand. Sadly, I think it has not completely gone into wide release as it is not yet available in Kansas City, but hopefully it is playing somewhere near you. MONSTERS was directed by Gareth Edwards, previously a visual effects specialist and a director of several Documentaries. Hijinks's ensue. This is as much a complex relationship film as it is a creature feature. To Edwards credit, perhaps based on the availability of time and funds, the monsters only have a modest amount of screen time. This film is as much about the suspense as it is about the visceral scares. Did he pull a page from Spielberg's JAWS playbook? Perhaps he did, but regardless of how he came to that conclusion in his story telling, it works. I gave Monsters a 4.5 of 5 horns, mostly because of the unique voice telling this story and the shoestring budget that impressed me with how well they spent their money. Check this out if you can, it should be playing somewhere near you soon. My to-see list over the next week or so includes: Hereafter, Saw 3-D, Buried, and Due Date. If I can see all those by the end of next weekend, I'll be a HAPPY RHINO. Also, I am considering putting a Reel Rhino podcast together with a buddy of mine. We are working out the logistics, but I hope that it comes together so you can actually hear the excitement in my voice when it comes to all things movie.